Our gratitude to the Huron Clinton Metropark Authority for helping us put on this race, especially to Jerry Cyr for helping us with the permit requirements and to Head Groundskeeper Adam Haberkorn and his crew at Huron Meadows. They are out all week before the race checking the trails and moving tables for our runners. If you haven't experienced this park yet, come out and run the trails sometime. And make sure to revisit the park in summer. Everal Race Management is our timer and we're committed to getting results quickly. 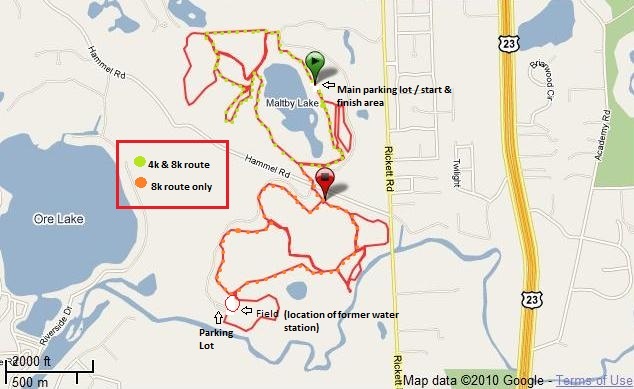 In fact, the timer uploads the results to RunMichigan.com before they even leave the park! How's that for fast? Awards go 3 deep in the following age groups:14 & under, 15-19, 20-24, 25-29, 30-34, 35-39, 40-44, 45-49, 50-54. 55-59, 60 & up.